Reviews of various gluten free products! I know I’ve been pretty MIA recently, but I have a fabulous excuse! I got married! Yay! Now, I’ll be honest here- I’ve been married now for a month. It’s been great, but it has completely taken a hit on my body! Between going out to eat and celebrating, not to mention being maid of honor in one of my best friend’s wedding last week, I haven’t been eating well at all. I’m pretty sure there has been a constant gluten exposure as well, but I haven’t quite figured out what the source has been. 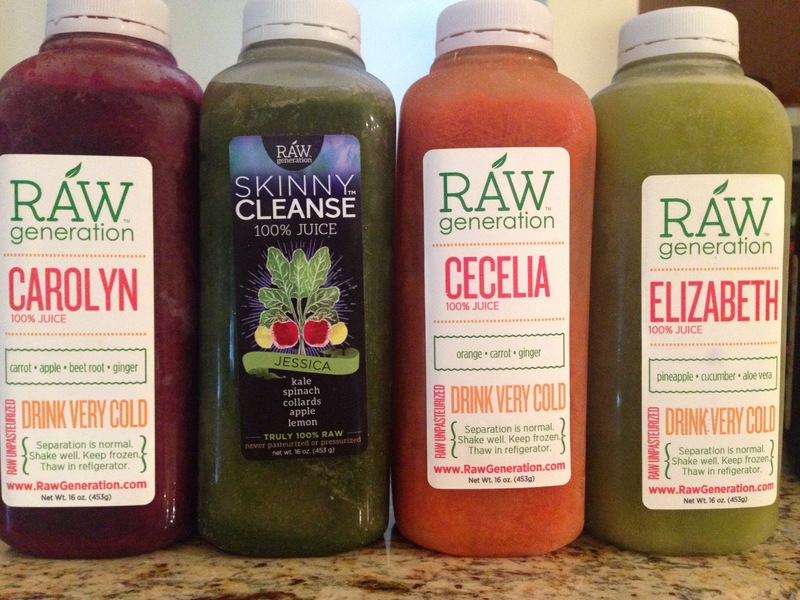 One of my friends recommended trying a juice cleanse for a few days and after researching a few, I decided to try the Raw Generation Skinny Cleanse. I honestly wasn’t planning on doing a cleanse after talking to my friend, but then suddenly came across a coupon code online. I figured this was a sign and, after all, it couldn’t hurt to try it. I have to admit though that I’m not very good with these diets. I’m from the Midwest and LOVE my meat and potatoes (and wine). Yeah, I use my nutribullet at home to make some yummy smoothies and “juice”, but not every day and certainly not for every meal. Here’s the details on how this works! I decided to do a 5 day cleanse. They offer a 3 day one as well, but I decided if I was going to do this, I could make it for 5 days to get more benefit out of it. Now, there is also a 7, 10, and 14 day options as well for those more ambitious than I am. Could I make it 7 days? Probably, but I like to enjoy my weekends and having to keep the juice with me while running around with my friends does not sound fun and would probably not be worth it in the end for me. I know I would end up “cheating”and it would be a waste of money. I can behave Monday- Friday! 10 and 14 days? No way. Not gonna happen. The plan requires you to drink 6 bottles of juice throughout the day and allows for you to eat fruit if you are hungry. The juices are named Jessica (which you drink 3 times/day), and Cecelia, Carolyn, and Elizabeth. It’s kinda cheesy but it’s better than reminding me what I’m drinking. The drinks are shipped to your house frozen so make sure you have room in the freezer to store them. I left mine in the freezer and took enough out for 1 day and put them in my “lunch box” for work. It says to eat them when they are very cold and after a few sips, I understand the biggest reason why. The can taste pretty nasty warm. Horrible. Eww. But when they are super cold they aren’t so bad! Okay I will admit it was hard to drink them the first day. It took a bit to get used to the taste because I’m not a huge fan of all of the ingredients, but that comes with premade juices. By the time I got to the second serving of Jessica, though, it had started to grow on me. I did pretty good with Cecelia, but Carolyn and I are not friends. We never will be. I absolutely hate beet root. That being said, I pushed through it and managed to finish it. I usually had a glass of water along with the juice because it helped rinse the taste from my mouth (moreso with Carolyn than the others). I was hungry by the end of the day, but by no means was I starving. The six juices and extra water I had between servings had held me over until I got home from work. I did salivate a bit while my husband was making his own dinner, but I decided to take a hot shower and give myself a facial to distract myself. After a handful of grapes I was ready for bed. It was MUCH easier to make it through the day. Today Jessica didn’t seem so challenging and I was able to get through Cecelia and Elizabeth with no problems. Carolyn? Well, I finished most of it. I brought some fresh fruit to work to snack on since I was working late and when I finally went home I felt great. Not hungry at all and definitely still had some energy to do laundry. I should note that since the end of day one though I have been going to the bathroom like crazy. I swear I have to pee every 2 hours and today was no exception. Piece of cake! (Okay I wish there was cake, but at least the day is getting easier to get through). I didn’t feel hungry at all today and I managed to finish all of Carolyn today. It is important to remember when you are juicing or doing a cleanse, they are meant to have a nutritional benefit. They are NOT meant to fulfill your pleasure eating side of life. I will NEVER crave one of these drinks. Nope. I’ll save that for a vanilla milkshake. However, I could easily do these again. Today I haven’t had any sugar/salt cravings which I usually have after my midafternoon slump. I haven’t felt the highs/lows with my sugar during the day either. You don’t have to be diabetic for variations in sugar to start affecting your focus and energy level! It happens to everyone with their sugar highs! The higher you go, the harder you crash. I had the day off of work today which actually made the day go by faster because I had some errands to do. I’m not sure if it was the constant distraction of chores/grocery shopping/etc., but I didn’t feel hungry at all today. I some grapes for a snack after taking my dog for a walk, but otherwise the juices were pretty easy to get through (I’m even finishing all of Carolyn now, but I’m still on the fence about Elizabeth). I have to admit that I have noticed my pants are a little more comfortable lately (yeah the wedding celebrations may have made them a little more snug than they should have been!). I refuse to get on the scale though until I’m finished with all 5 days. I’d rather be driven by how I feel than by a number on the scale! Made it! Finally! Honestly, it wasn’t as bad as I was expecting it to be. I definitely had more energy throughout the day and did not experience my midafternoon slump after day one. I’ve tried juicing on my own for a few days and given up due to the hassle of having to clean my juicer/nutribullet/whichevergadgetisclean, not to mention the hassle of picking up fresh fruits/veggies , etc. The juices are decent. Again, like I said, I’d prefer a vanilla shake, but these weren’t so bad. They are a little “gritty” but I didn’t mind it after the first day. I prefer my juices to be strained, but you do lose some of the nutrients that way (I’m not a fan of pulp in my OJ either so it is just a personal preference). That being said, I would absolutely do this cleanse again. In fact, I’m probably going to order another round after my honeymoon!